While the histories of coffee and tea began in different parts of the world and at different times, the correlation between the two is one of ancient trading and more than a little bit of folklore. We hear tales of the accidental discoveries of these two commodities, and these legends are now steeped in the histories of China, where tea was discovered, and Ethiopia, whose farmers and herders happened upon the first coffee trees. Much has changed in the thousands of years since humans accidentally began experimenting with what would become two of the most sought-after commodities on the planet. Today, coffee and tea maintain their roots in different cultures, but the appeal of both drinks extends across the globe, despite the fact that many still associate tea with Eastern cultures and coffee with those cultures in the west. The trees that produce these two products are very different, as are the methods used in harvesting. Tea leaves are plucked from the branches, dried, and packaged. Coffee cherries are picked and either washed or, as is the case at Finca Deborah, carefully dried using a natural and more eco-friendly process that requires little or no water. Both methods, however, produce the same end result, which is the green coffee bean. But what happens to the fruit that surrounded the seed? Traditionally, the pulp was discarded during the hulling process, or it was repurposed as fertilizer for the young trees on the estate. 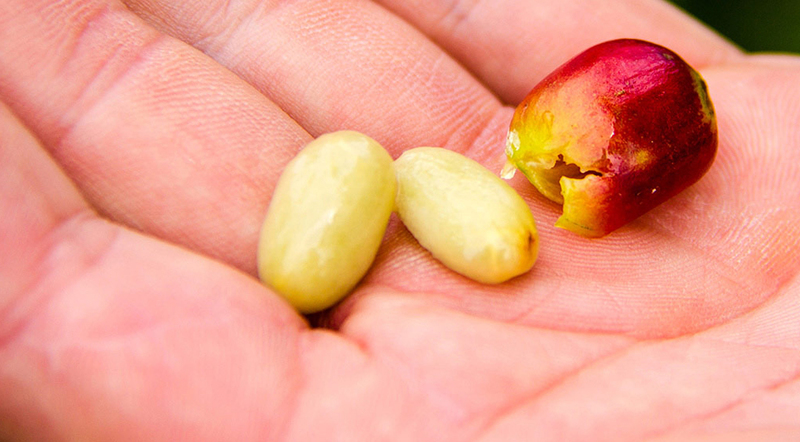 However, many coffee historians believe that the fruit of the coffee cherry was likely consumed by humans long before crafting a brew from the seeds was even considered. As more and more coffee growers embrace sustainable practices and move toward utilizing every part of the harvest, the lowly coffee fruit – also known as cascara, which means skin or peel in Spanish – is seeing a renewed sense of purpose. But what can be done with these dried skins and pulp of the coffee cherry? Just like the valuable seed inside the fruit, the cascara is treated in the same, careful manner during the drying period of its life. The cherries are dried with the fruit intact, which not only enhances the overall process and creates an exceptional Finca Deborah Geisha profile, it also results in an excellent cascara bursting with delicious floral and fruity notes. When removed from the bean the cascara takes on a life of its own. This once discarded fertilizer has realized a new life and purpose and, in many ways, is no longer directly equated to coffee; some people now call it tea. 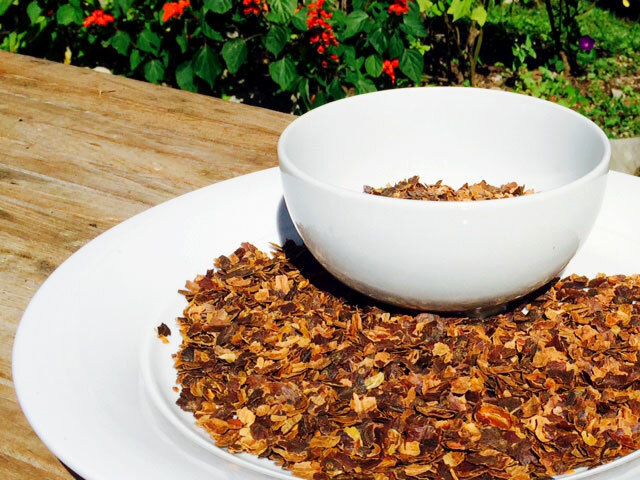 Brewing a cup of cascara is quite simple, as it is prepared in the same manner as tea leaves. A measured portion of the dried skins is placed in hot water and steeped until the flavor and consistency is to the drinker’s taste. Most cascara lovers prefer to use a French press for this process, but almost any steeping and straining method will produce the same result. The flavor of the cascara brew is described in many ways and the subtle differences in taste are the result of the different types of coffee bean that once lived inside the fruit. Some describe the brew as distinctly tea-like, with fresh notes of floral and other earthy flavors. It can also come across as tart and relatively acidic. Some roasters have submitted their cascara for caffeine testing, and the results are interesting. Many cascara drinkers have reported feelings that one would typically associate with high caffeine content, but the test results show something very different. Cascara generally has a caffeine content that is about 25% that of coffee or less, even after a longer than normal steeping period. It has been surmised that the sugars present in the cascara contribute to the energized feeling reported by many of its drinkers. Sustainability is a key component of our mission statement here at Finca Deborah, and using or repurposing every aspect of our harvests is a core component of that statement. When we drink our Finca Deborah cascara brew, we’re reminded of the long and storied history of the coffee tree and its fruit, and are delighted by the floral, fruity flavors presented by the cascara tea. It’s just one of many reasons why we love the Finca Deborah Panama Geisha, seed, fruit, and all.